Shoot the rapids on the Pacuare River on this day tour from Turrialba. 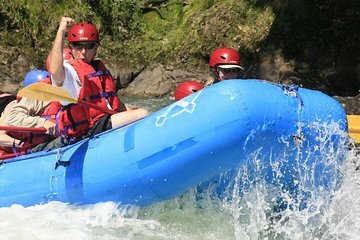 With a guide providing instruction and ensuring your safety, paddle down 18 miles (29 kilometers) of Class III and Class IV rapids through Costa Rica's lush landscape. Stop for guided hikes up waterfalls located in hidden canyons and at a base camp halfway for lunch. Learn about the surrounding ecosystem, flora, and fauna through your guides' commentary.